In her first We Hear You blog as the Australian Children’s Education and Care Quality Authority (ACECQA) Chief Executive Officer, Gabrielle Sinclair shares her thoughts about the National Quality Framework and a recent visit to the Northern Territory. One of ACECQA’s functions is working with regulatory authorities to educate and inform services and the community about the National Quality Framework (NQF). Since 2012, educators, services, schools and governments have undertaken a significant journey in implementing the new laws, regulations and the National Quality Standard. While it took time to get across the detail of the new national system, over 88% of services have now been assessed and rated, with 73% rated Meeting National Quality Standard or above. Over the next five years, our challenge is to continue the quality improvement journey and support parents and carers as well-informed consumers of education and care services for their children. In my new role as ACECQA CEO, I am learning a great deal from you about the diversity of communities across Australia; the unique circumstances in which services operate; the rich experiences of families; and the way we all respond within a national framework. Recently, I was delighted to be given the opportunity to meet with the Northern Territory Minister for Education and speak at the 2017 Leaders’ Conference in Darwin. I was impressed by the determination to raise quality in the NT and the unique way leaders in both sectors were enriching children’s experiences and improving learning outcomes. The continuous quality improvement journeys shared by Principals Leah, Joe and Graham, highlighted the critical fact that good leadership is all about results. To achieve better results, they spoke of giving a voice to the expertise and knowledge of early childhood educators, teachers and local families. They reflected on the immense value of listening to and understanding the perspectives of children. During my visit to local services, I met with very insightful educational leaders who were deeply connected with their local communities. At Nightcliff, there is a strong partnership between the early learning centre and the school with the aim to give young children a seamless experience from long day care to preschool and on to school and outside school hours care. The results are tangible. The physical and sector barriers are being removed; the early learning centre and the school are sharing quality resources; families are welcomed; and the focus is very much on building confident, enthusiastic young learners. In both education sectors and in every jurisdiction, we are listening to inspiring educational leaders who share their stories. 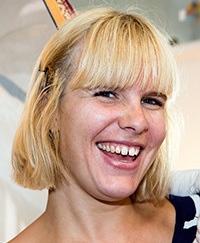 Although each experience is unique, a common reflection is that improved, sustained results are unlikely to happen without a commitment at the highest level; a deep understanding of the NQF and the roles we all have; a determination to improve beyond a single point in time; respect for the early childhood profession; and genuine partnerships with families and the community. We have learnt so much since 2012. It is worth sharing our own NQF journeys with others – across services, sectors and borders – and with our families. It is a truism that everything that gets measured gets better and, as Joe reflected, do our children deserve anything less? 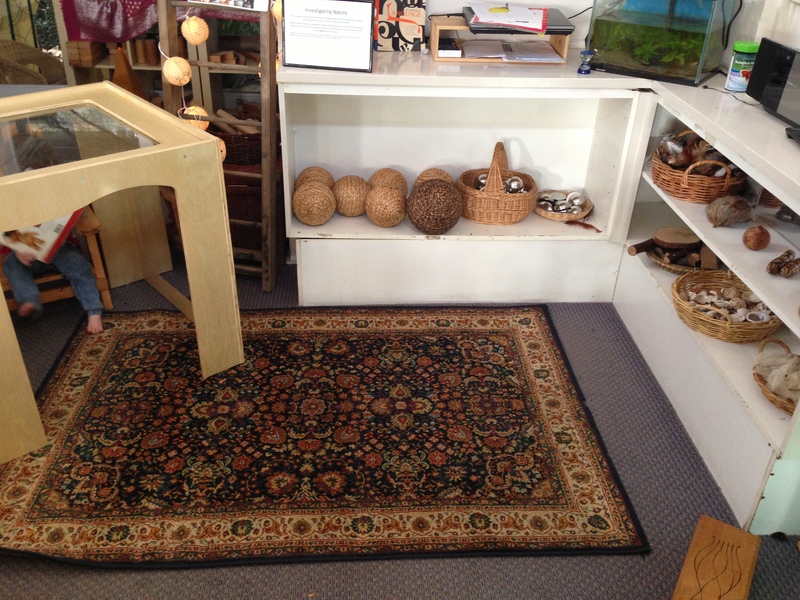 Educators at Goodstart Red Hill had long admired forest kindergartens from afar, never really considering how that might look in an Australian setting. Then they realised they had an amazing and diverse environment right on their doorstep. 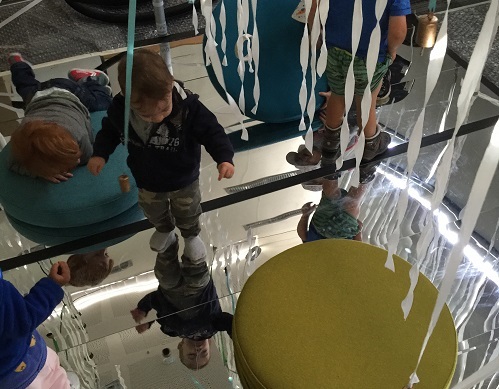 Skye Devereaux, Early Childhood Teacher and Educational Leader, writes this month on how Goodstart Red Hill developed their Nature Space program. The Educational Leadership team at Red Hill had a goal to provide all our children with regular opportunities to connect with nature and develop a sense of wonder, curiosity and respect for the environment around them. We wanted children to develop a love for nature and the world in which they live, in the hope that they have a strong connection with the environment they grow up in and, maybe one day, will figure out how to fix the environmental issues they inherit. The planning process was extensive, spanning many months from when the idea was born in late 2013. We identified a nearby wild space with access to Ithaca Creek, which our service backs on to, and a wonderful enclosed forest space. Excursion plans were completed, along with a variety of risk and benefit assessments for the different activities we imagined would take place. We consulted with the Goodstart Health and Safety Team, seeking advice and guidance. The Red Hill educational team participated in training with Nikki Buchan, an educational consultant, on bush schools and the benefits of wild nature play. An event was then held to inform parents about the Nature Space program where we invited feedback and answered questions. After this preparation we began taking small, mixed age, focus groups of children to the wild space, observing how they engaged in the space and the supports they (and we) needed. We hosted a weekend Clean Up Australia Day event with our families, introducing them to the wild space. Fifty people from our learning community attended and our risk and benefit assessments were displayed through the wild space. At the end of February 2014, we began taking whole class groups out to the wild space. Each class, from toddler through to kindergarten, ventured out for one morning each week between 10am and 11.30am. We packed our little red wagon with first aid essentials, water bottles and baskets for collecting, and let the natural environment seize our imaginations and guide our play. 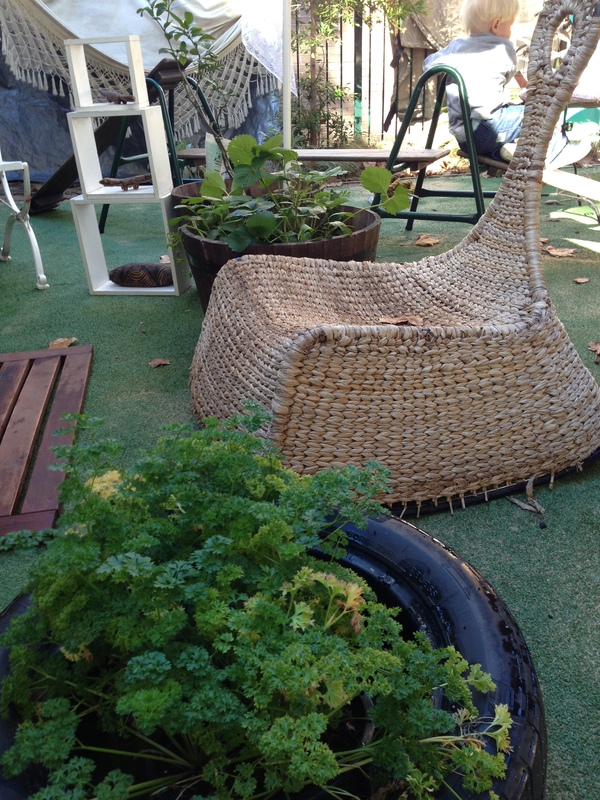 Since beginning our nature play program, the children at Red Hill are noticeably more confident and resilient learners, with an adventurous, enquiry based approach to learning. Through their play in the wild space they have become proficient at self-risk assessment, and approach risky play with careful consideration and minimal, respectful support from their peers and teachers. The children have learned to slow down and spend time to look, watch and wonder. The Nature Space program allows time for the children to imagine and create using only what the environment provides. A log becomes a baby, crushed bark some snow and a bouncing log becomes a rocket, a horse or a broomstick. Children willingly collaborate and support one another in the challenges presented with determined perseverance and confidence in their eventual success, if not this week then perhaps the next. The older children, now with several years of play experience in the space, share their stories and pass down skills to the younger children and so each new year group learns about the Magical Forest, Sunshine Hill and The Giant’s Chair, each named by children who have now passed through the dense trees and leafy carpet for a final time. They are creating new, oral histories but at the same time are curious about the original occupants of the space, wondering what came before. In the two and a half years since the program launched, the way we inhabit the space has changed somewhat. As the environment and our knowledge of it have developed, so too has our play. While our time was initially focussed on the creek and Sunshine Hill, now we play almost exclusively in the forest. Make believe play has emerged as the prevailing form during the visits, with games and ideas carrying over weeks and even months. Mindfulness has become a focus of the groups’ visits with children engaged in before and after practices of being, reflecting on their presence in time and space. Our hope continues to be that these children will grow up with fond childhood memories of their time spent in this space with us, and leave us having developed a strong connection to and understanding of the world around them. The assessment and rating process can be a nervous time for educators and providers. To coincide with National Family Day Care Week earlier this month, we chatted to Eugenia Gabbiani, a family day care educator at the City of Casey in Victoria, about her experience being assessed and rated and her advice for other educators. 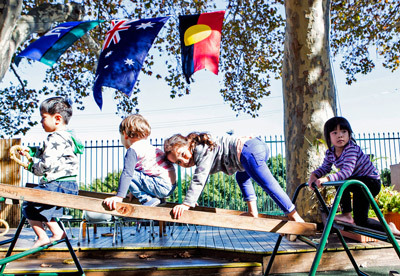 The City of Casey Family Day Care commenced in 1995 following amalgamations of family day care services in surrounding local government areas that created the largest family day care service in Australia! Our service remains the largest, currently operating at an average level of 800 equivalent full time places with around 235 educators offering care in their homes to over 2500 children with help from 18 very supportive members of our coordination unit. How did you prepare for your assessment and rating visit? The City of Casey has been preparing educators since the commencement of assessment and rating by providing training, advice and information to ensure we are aware of the expectations. Before the visit, I talked to children in my care about the people coming to see us that day and also spent some time making sure all my documentation was up to date and easily accessible for assessors. Did you have any concerns or were you nervous about your assessment and rating? On the day of the visit, I did get nervous. I think it is natural for anybody being assessed on their work performance to be a little nervous. Though once the assessors arrived and the process started, my nerves eased quickly as we were able to show them our service. Overall I was confident, as we offer high quality education and care every day regardless of being visited. Do you have any advice for family day care service providers that are due to be assessed and rated? All educators, not just family day care, have a responsibility to provide the best quality of care every day. When preparing for an assessment, my advice would be to have all your documentation up to date, easily accessible and ensure children’s files are readily available as the assessor will ask to see this documentation. Make sure that you know what you do – this means know your emergency procedures. Take time to familiarise yourself with regulations as the assessor could ask you questions about this. Have your activities ready to reflect your program and what your children have chosen for the day. Have your observations available. We are a multicultural society; include diversity in your activities. I know that children in our service enjoy learning rhymes in other languages. If you have children from other cultures, learn basic words in that language and greet children and families with “good morning” in their mother tongue. Document this so that assessors know you are doing this. An Australia Day activity at Eugenia’s family day care service. Importantly, be proud of the fantastic job you do as an educator. Display your certificates, diplomas, awards and commendations. Not just for the assessor, but for everyone who comes into your service. Display your children’s artwork as they too are very proud of their work. Have photos of children doing some of the activities planned by you and the spontaneous ones initiated by them. You can also have a ‘community board’ where you can place pictures of the places you frequent with the children. These recommendations are not just for the assessment and rating process but for your practice. My main advice for family day care educators, and all educators, is to ensure your service is a high quality one all the time, not just when you are being assessed and rated. Treat assessment and rating as an opportunity to show off your practice to the assessor, let them see that you are prepared and proud of the education that you provide. You might also like to read our Embracing the assessment and rating process interview from last year with Vashti Hicks, an Authorised Officer with the Queensland Department of Education and Training. Michelle Gujer, Manager of Docklands Children’s Program and Georgie Meyer, Melbourne Museum’s Education and Community Program Manager, share a rewarding project showcasing children’s sense of agency and partnerships with their community. The Melbourne Museum is redeveloping its children’s gallery and as part of the project decided to consult with educators, early childhood specialists, designers and health professionals to make the space as unique and innovative as possible. The initial plan was to include children at the testing stage of the project, but we helped the Museum team see the value in including children’s thoughts at the planning stage. How were children’s voices heard? The children’s ideas and opinions were captured at every stage of the redevelopment and it’s a real credit to the Melbourne Museum’s commitment to their educational program. After meeting with our Leaders Group and brainstorming ideas, the Museum team organised workshops and gave each child a design board to create their own unique museum. Educators scribed the children’s thoughts as they talked though ideas. The Museum team then set up mirrors, cardboard boxes, rope, streamers, lights and animal noises and watched how children of different age groups engaged with different materials and tactile/sensory experiences. The younger children jumped right in to this. At first they were throwing cardboard boxes in their excitement but then settled into making fantastic dens with the boxes and pieces of fabric. This showed both the Museum team and educators that you don’t always have to be just two steps away. You always have to be mindful and watching, but there’s value in giving children the opportunity to show you what they are thinking in their own way, without prompts and questions. Activities like this are a beautiful way of showing children’s expertise, especially at the pre-verbal stage. My advice to Educational Leaders looking to make connections with the community is to start a conversation because you never know where it’s going to take you. We received an initial invitation from a Melbourne Museum through a mutual colleague which kicked this amazing opportunity into motion but the really important thing is there was willingness on both side. We could have provided feedback via email on the initial consultation and left it at that but instead invited the Melbourne Museum team to visit and engage with our Leadership Group. It’s about valuing everybody. Everybody has knowledge and ideas; especially children. Working with Gowrie Docklands has given museum staff a rich understanding of, and respect for, the opinions of young children. Our workshop sessions demonstrated that pre verbal children have a lot to say, and Gowrie staff showed us how to listen. Our new Pauline Gandel Children’s Gallery is specifically for children aged six weeks to five years. Through our time spent with the Gowrie children, we’ve seen that this is a very broad and diverse age range and each age and stage of development has particular needs and interests. We’ve also learnt that children are drawn to experiences that offer a balance between the familiar and unfamiliar. For example, they recognise and love a mirror, but even more so if it’s placed on the ground and can be stepped on. Children are curious about nature, animals, (friendly) monsters, hiding places and surprises. They move, crawl, climb, dance and jump as a way of learning, not just a way of ‘letting off steam’. And the exploration of music and light appeals to all age groups, particularly when children can immerse themselves in the experience. Listening to this feedback, we have incorporated many of the children’s ideas into the new Children’s Gallery. The space will have activities relevant to each age group, including tactile, hands-on experiences for younger children and narrative, games and social play for older children. Familiar animal specimens from our collection will be on display, including birds, butterflies, a zebra and a leopard, which will lead children into an immersive multimedia experience. Children will enter this ‘Camouflage Disco’ full of lights, patterns, movements and sounds that will surprise and delight with a crawling crab, tiger stripes, a swimming fish, and giraffe spots. The garden will be completely renovated allowing for nature play, exploration and outdoor movement. Rocks and minerals representing those in the Museum Collection will form a rock garden and crystal cave. An accessible sandpit will be home to a life-size dinosaur skeleton, the long-necked Mamenchisaurus, inviting children to excavate fossils. And the Victorian Aboriginal creation story of Tiddalik, the thirsty frog, will feature in a series of sculptures that end with a fountain offering water play. 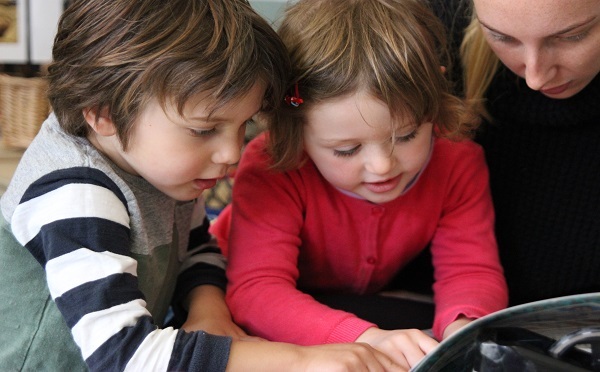 We plan to continue our consultation and evaluation sessions with young children throughout 2016. We also hope our youngest co-creators will attend the launch of the new gallery later this year so we can thank them for their generosity, advice and ideas.